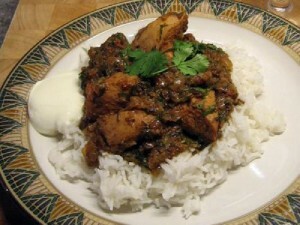 Chicken Vindaloo recipe by Rakhshi at DesiRecipes.com. First of take a oil in fry pan and fry the bone less chicken and when it turn golden brown then take them aside. In the same oil put the methi dana and bay leaves and mustard seeds (raie)and fry the onion until they will golden brown. Add haldi , cayenne pepper, paprika, crushed cumin and corriander, salt , garm masala, tomato puri/paste and fried chicken then add water and cooked well in form of a thick gravy. Add more water as required and in last cider vinegar and cook 5 mins and serve it with roti or naans n enjoy this hot spicy chicken vindaloo. This chicken was amazing!!! thankz fo da greattt recipe..